Since January 1, 2001, Labor Standards Law (2000) has been taken effect officially in Taiwan. Under the law, there are two-day weekend and the labor hours are reduced to 84 hours for two weeks. As a result, the public is going to enjoy 144 days of vacation per year. The time for leisure and recreation has increased substantially. In addition, GNP in Taiwan reached $12,941 in US dollars (Executive Yuan, 2001). As shown in Table 1, Taiwanese residents have not only the wealth but also the time when the Physical Labor Datum Law took effect. Moreover, Gross National Product has reached a total of $2,883 hundred million (Executive Yuan, 2002a) which rose in rank to the developed country. 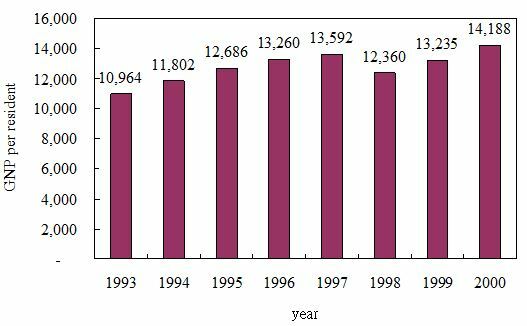 As far as for the employment structure, the publication of Directorate General of Budget Accounting and Statistics, R. O. C. Taiwan Region Human Resources Statistic Outcome (Executive Yuan, 2002b), reported that service industry occupied 57.28% surpassing the total of industry of agriculture and fishery. A separate statistic, Report on the Survey of Family Income & Expenditure in Taiwan Area of the Republic China (Executive Yuan, 2000b) , pointed out that consumers expanded 13.51% of the income on entertainment, education, and culture service in 2000. All of the above has reflected the living qualities of Taiwanese residents. The investigation also indicated 72.2% of Taiwanese residents of age 15 and higher reported participating in physical activities during leisure time which was a little lower than 74.5% in Japan. More, the participation rate for physical activity was 74.2% in male and 70.3% in female. Three common forms of physical activities practiced by 51.7% of Taiwanese residents were jogging, walking, and quick walking. 21.6% exercised everyday and 58.4% reported doing the above activities weekly. The next common physical activities were mountain climbing and hiking about 32.6%. Of which, only 4.4% reported participating daily and 26% weekly. Depending on age, regular exercise and age had an opposite trend in Taiwanese residents. 85.8% and 48.4% of Taiwanese residents age 65 and above reported jogging, walking, and quick walking as well as mountain climbing and hiking. However, the rate dropped to 50% to 20% for age of 50 and under. This has indicated the need to form a habit of regular and sustained physical exercise. Furthermore, many research and studies related to exercise participation or recreation pointed out that there were only a small number of Taiwanese residents participating in regular exercise. For example, Executive Yuan Physical Education council published a study in May 1999 (Chen & Yan, 1999) indicated there were very few residents participated in regular physical activities even though there were over 90% of the people reported engaging in recreational activities. School education and public policy needed to improve and cultivate the public’s knowledge in utilizing time for physical activities especially Taiwanese society was generally work oriented. Studies related in desire in physical activities, Liu and Wang (1999) believed residential area, gender, age, occupation, and education were related to types of physical activities, time, and location. The most desired physical activities were badminton, table tennis, bowling, jogging, and cycling whereas the most engaged activities were badminton, swimming, jogging, basketball, mountain climbing, billiards, bowling, quick walking, and folk dancing. Time for participating physical activities was before eight am and after six pm and locations were community park, riverside park, school stadium or sports ground, and at home. Similar research and studies reflected that behavior, desire, and conscious of Taiwanese resident’s physical activities were limited to facilities and locations, which should be further researched by the department of physical education. Past research pointed out the relations among desire and conscious of physical activities, age, gender, economic status, and recreation skills needed to be studied. How to evaluate and understand the above relations so results can be applied practically is valuable to academic research as well as policy making in the government. The purpose of the research is to investigate the preferences, routines, conscious and opinion of Taiwanese residents in physical activities related to government policy in developing physical education and recreation activities. The scope of the research included 25 counties and cities in Taiwan (Jilong city, Taipei county, Taoyuan county, Yilan county, Hsinchu city, Hsinchu county, Taichung city, Taichung county, Mioli county, Zhanghua county, Nantou county, Yunlin county, Jiayi city, Jiayi county, Tainan city, Tainan county, Kaoxiong county, Pintung county, Penghu county, Taidong county, Hualien county, Taipei city, Kaoxiong city, Jinmen county, and Lianjiang county. Subjects are Taiwanese residents age 15 and above with physical capacity. The study also utilized computer-assisted telephone interviewing system to conduct interviews. French philosopher, mathematician, and physicist, Rene Descartes, said “Cogito Ergo Sum – Thinking Accounts For Being”. Therefore, the meaning of consciousness speaks for itself. Hobson (1994), a professor at Harvard Medical School, indicated consciousness is the brain becomes aware of certain information. The individual consciousness changes its focus or goes into different levels when the brain pays attention to or experiences different things at the time. There are six levels of consciousness: unconsciousness, subconsciousness, marginal consciousness, focal consciousness, unconsciousness, and pre-conscious (Bernstein, Clarke-Stewart, Roy, Srull & Wickens, 1994). Unconsciousness is how individual not knowingly regards to things in the environments. For example, an individual is unaware of one’s own heartbeat or pulse. Subconsciousness is an individual with experience of consciousness but indistinct of the content of the consciousness. Marginal Consciousness: an individual has experience of consciousness, but don’t have enough clarity about its content. Focal Consciousness is what an individual perceive explicit consciousness when one focuses on something without distraction. Unconsciousness is the emotion, desire, fear or complicated experience underneath an individual’s conscious mind. Even though unconsciousness is controlled by the consciousness, an individual is not aware of it. Pre-Conscious: unconsciousness is a point supported by scholars of psychoanalysis. However, they also believe that between consciousness and unconsciousness lays another level: pre-conscious. The major difference between pre-conscious and unconsciousness is that the overstock experience of the unconsciousness cannot be recall by an individual whereas experiences in pre-subconscious can. Through the process of psychoanalysis, an individual is able to recall an experience from unconsciousness to consciousness, which needs to pass through pre-conscious. Whether a conscious state exists in an individual depend on three aspects: reaction, recognition, capabilities and character of moral integrity (Darley, Glucksberg & Kinchla, 1990). The nature of consciousness is in motion, a process and exists at present (Edelman, 1989). Consciousness allows unity in experiences (Dennett, 1991). In the capability of controlling consciousness, Jacoby, Lindsay and Toth (1992) pointed out the main function of consciousness process was to allow an individual’s ability to control an environment in order to reach a goal. When expected outside force disturbs behaviors of a preplanned goal, the capability of controlling consciousness was going to emerge noticeably. To classify each everyday activity as sports, recreation, play, physical activity, or sports activity is not a simple task since the participant can decide or plan the mode of physical activity depending on people, affairs, time, and location. Bucher and Krotee (1998) classified the scope of physical activities from play, recreation, community activity, school physical education and sport, sport clubs, amateur and Olympic Sports, intercollegiate sport championships to the professional competition. The above physical activities have many differences among each other. Other classifications of physical activity or sports are open and close, individual and team, as well as professional and amateur. It can also be classified into three categories: recreation, prized and professional. Furthermore, some scholars classify physical activity in absolute sports or whether the activity requires equipment and facility. If to classify physical activity by its goal, it can be categorized into professional, educational and recreational. Moreover, it can be defined by the concepts: broad sense as in competing with another person or narrower sense as in self-striving. In addition, it can be limited to a race or competition to be totally distinguished from physical education or training. The purpose of the research is to understand Taiwanese residents preference, habit, value and view on government policy making regarding to physical activity based on gender, age, education, occupation, family monthly income and location. Therefore, the research focused on demographic statistics and aimed at analyzing among variables. The research structure is shown in Table 2. The process of the research is to decide a research topic before finding out research motivation and research subjects. After deciding the research purpose and scope, literatures related to consciousness, physical activity and physical activity participation are gathered before drafting the research method. The Table 3 is the research process. To conform to the research requirement and understand indeed the consciousness of the physical activities in Taiwanese people, the research subjects include Taiwanese residents of age 15 and above with physical capability in 25 different counties and cities. The sample size is the population of these 25 different counties and cities in 2001. However, the sample chosen in this research is limited to the sampling method, which could not reach the same accuracy of the random sampling. To minimize the error in the survey and increase the representativeness of the sample group, the samples chosen in the research reach 99% confidence level and 2% error. Based on the above condition, the formula is used to calculate the number of samples needed for this research, which are 4,161 samples. Therefore, the research planned at least 6,000 valid samples as the goal. The research gathers data through a questionnaire designed and developed by the researcher, the Investigation of the Consciousness of Taiwanese Residents Questionnaire. The questions in the questionnaire cover the subject’s interest, habit and value in participation of the physical activities, opinions on physical activities policy as well as background information. Based on the research goal and its scope, preliminary questions were initiated. Later, the research team examined each question to make sure the wording was clear and comprehensible as well as whether the language used were able to be comprehend by subjects with various backgrounds. After revising, questions were organized into a first draft questionnaire to be reviewed by seven experts in the field from different universities and colleges in Taiwan to see if the questionnaire conformed to the goal of the research. Moreover, Physical Education Committee in Executive Yuan invited various experts and specialists as well as the research team to again modify and provide specific suggestions on September 16, 2002. After the above revision, the research team tested the questionnaire using FJS-CATI system on September 24, 2002. The subjects were selected from 25 different counties and cities. There were 188 subjects with 94 males and 94 females and of these 188 subjects, 107 agreed to be retested after five days to ensure the validity of the questionnaire. From the pilot test and pre-samples, the questionnaire did not need further revision. In addition, comparing the first and the second interviews by the same 107 subjects, every question has an identical rate between 80.37% (86 subjects have parallel answers) and 100.00% (107 subjects have parallel answers). 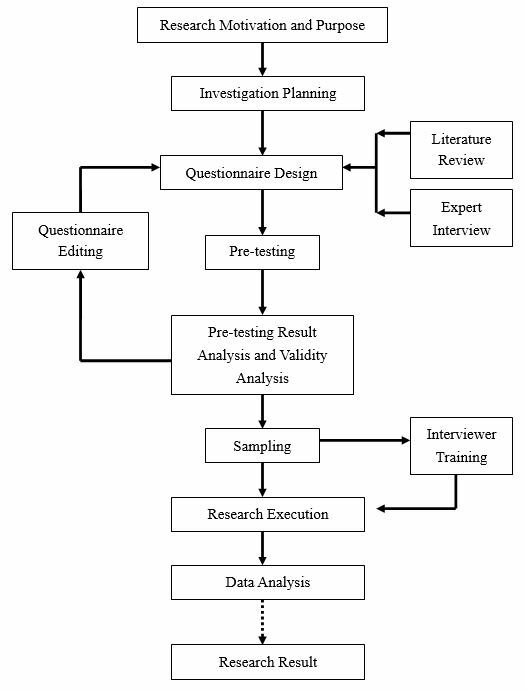 Therefore, the process of developing the questionnaire and drafting the questions include not only multiple revisions and examinations of sports experts and professionals as well as investigation by the government, which gathered experts from various backgrounds, but also pilot-testing to ensure the validity and effectiveness of the questionnaire to make certain it indeed matches the purpose of the research. As for the effectiveness of the contents, results from the first and second survey are consistent which also represented the validity of the questionnaire. 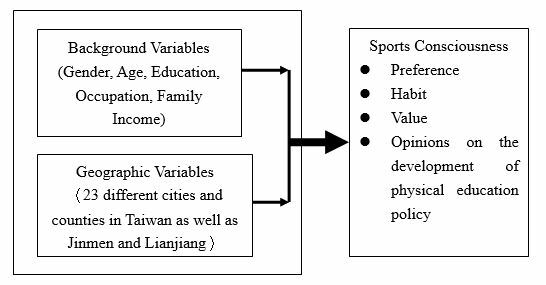 The purpose of the research is to investigate the preferences, routines, values and opinion of Taiwanese residents in physical activities related to government policy in developing physical education and recreation activities. Subjects are Taiwanese residents age 15 and above with physical capacity. The study also utilizes computer-assisted telephone interviewing system to conduct interviews. There are total of 6,000 subjects in the study; however, within one month, there were 11,688 subjects contacted. Of 11,688 subjects, 4,014 subjects refused the interview and 7,674 accepted the interview. The success rate is 65.66%. In 7,674 subjects, the number of male and female subjects are 3,755 (48.93%) and 3,919 (51.07%). The age group of “36 – 45” has the most subjects which is 1,739 (22.66%), and next group is “23 -35” which is 1,668 (21.74%). As for the education background, “college and above” has the most subjects, 2,336 (30.44%) and the “high school” comes in second, 2,332 (30.39%). For the category of occupation, “unemployed” has the most subjects, 1,984 (25.85%) and “administrative staff” comes in second, 1,024 (13.34%). The family income of “40,001~50,000” has the most subjects, 1,228 (16.00%) and “50,001~60,000” comes in second, 1,106 (14, 41%). The last category is the location, which “Taichung city” has the most interviewed subjects, 1,230 (16.03%) and “Taipei city” is the second with 1,100 (14.33%). Annotation: A = Military personnel; B = administrative executives, business owners and managers; C = professionals; D = technician and professional assistant; E = administrative staff; F = service workers and sales; G = agriculture, forestry, fishery workers; H = skilled workers and related; I = mechanics and operators; J = non technical and physical labor; K = unemployed; L = students; M = others; N = non response. The research result showed there were 7,575 (98.71) subjects participated in physical activity in the past three months and 99 (1.29%) subjects did not. In general, the most participated activities by 7,575 subjects in the past three months were walking (35.75%), jogging (29.21%), basketball (21.91%), hiking (12.82%), excursion (12.57%), and mountain climbing (12.36%). Of the 7,575 subjects, the reasons for participating physical activities were “to create health and strength” (40.79%), “interest and mood switch” (22.96%), “for work or school” (21.82%). On the other hand, 99 subjects reported the top three reasons for not participating physical activities: “too much work in school, housework, or kinds to exercise” (72.73%), “no particular reason” (38.38%), “no opportunity” (32.32%). When asked whether to watch sports programs or competition, 67.68% of 7,674 subjects reported to watch sports programs or competition regularly whereas 32.31% did not. The most enjoyed watched sports programs or competitions by 5,194 subjects were jogging (32.31%), baseball (26.67%), succor (22.66%), basketball (19.60%) and mountain climbing (15.09%). 93.11% reported watching sport programs and competitions, 50.27% reported from television, 36.79% listen from the radio and 19.98% reported researching from the World Wide Web. Last, when asked about the most anticipated physical activities in the past or at the presents, subjects reported walking (35.65%), jogging (29.71%), basketball (21.72%), mountain climbing (13.06%), and hiking (12.71%). 4,347 out of 7,575 subjects reported having regular physical activity which was 57.39% and 3,228 out of 7,575 reported not having regular physical activity which was 42.61%. When asked about the number of times in physical activity per week, 3,169 out of 7,575 subjects reported “once a week”, 22.77% of the 7,575 reported “twice a week” and 12.25% reported “three times a week. 47.72 % of 7,575 subjects reported exercise one hour or less each time. 30.01% reported one to two hours of exercise each time. 1,108 subjects exercised two to three hours each session and 579 subjects exercised three hours and more each time. When asked about the intensity of the physical activity, out of 7,575 subjects, 2,606 (34.40%) chose “moderate intensity”. 2,480 (32.74%) subjects reported “low intensity” and 1,570 (20.73%) subjects “moderate to high intensity”. 468 (6.18%) subjects reported “intense” and 451 (5.95%) subjects reported “mid-intense”. 2,151 out of 7,575 subjects reported doing physical activity in the “early morning” and 26.83% of 7,575 reported “afternoon” as the time of the day for physical activity. Next, 1,668 subjects reported “morning” and 1,369 subjects reported “during the night”. “Noon time” had 355 subjects. When asked about the partner, “alone or no partner” received 2,654 out of 7,575 subjects. Next was “a family member” with 1,881 subjects, “friends” was next with 1,402 subjects, “classmates” with 750 subjects, “colleague” had 412 subjects, “neighbors” had 343 subjects, and finally “no particular partners” was the last with 133 subjects. The top three locations mentioned by the subjects for physical activities were “park”, “sports field or stadium in school” and “private facility” with 37.28%, 35.08%, and 26.14% of 7.575 subjects. The percentage of subjects in each categories in the time for traveling to locations for physical activities were 63.74% for “10 minutes or less”, 23.52% for “11 to 30 minutes”, 8.17% for “31 to 60 minutes”, and 4.75% for “60 minutes and above”. When asking about the fee related to participating physical activity, 87.27% of 7,575 subjects reported “no” and 12.73% reported “yes”. The channels to receive information related to physical activity or exercise were “televisions” with 62.64%, “newspaper or magazines” 21.78%, “internet” with 8.58%, “radio” with 6.03% and “others” with 0.96%. For the item of “what are some of the information to be obtained?”. 53.52% of 7,575 reported “national and international competitions”, 34.11% reported “exercise guidance or instructions”, 8.71% reported “physical education policy” and the last was “others” with 0.66%. The first five values regarding to physical activity in 7,674 subjects were “health”, “team cohesion”, “stand by the rules”, “sports spirit” and “enjoyment”. The percentages were as the following: 39.25%, 13.79%, 13.55%, 12.97% and 12.05%. There are four open-ended questions in this category and 7.674 subjects. The questions focused on the opinions related to development of physical activity policy. The researcher summarized the reply of the first three questions “increase sports facility and fields”, “promote the concepts of exercise and health”, “open school sports facility and fields”, “increase professional sports consultants”, “offer free exercise instruction courses” and “offer sports competitions”. There were also answers that weighted less and categorized as “the others”. For the questions four, the content of the reply focused on “increase equipments of the sports field and facility”, “develop specific sports”, “hold international competition”, “future plan for the elite athletes”, “invite outstanding coaches”, and “practical physical education from childhood”. Other single answers were categorized as “the others”. The analysis of these four questions is as the following. To promote physical activity for the whole people, what kind of services do you think the government should enhance to increase your interest in participation? After analyzing the content of the answers, the research discovered that to increase the interest in participation of physical activity, the government needed to “increase sports facility and fields”. There were 2,290 similar replies. Also 1,749 subjects believed that “ promote the concepts of exercise and health” was the key to increase interests in participating physical activity. Moreover, 1,611 subjects thought that government needed to “open school facility and fields” to increase interests in physical activity. 807 subjects mentioned that “increase professional exercise consultants”, 609 subjects believed “offer free courses on exercise guidance” and 551 subjects considered that government needed to “offer more sports competitions” to increase people’s interests in physical activity. In the end, there were 57 subjects mentioned “not clear about government’s policy”, “never thought about it”, “no time for such matters”, “strengthen economy”, “more promotion”, “no interests to understand government policy”, “financial support”, “no opinion”, “more community activities”, “no need to develop policy”, “not important”, “stable life”, “traffic course needs to be clear”, “more teams”, “more trees”, “no ideas”, “plan more one-way street” and etc. All of the above answers were categorized into “the others” and it was 0.74% of 7,674 subjects. What are some of the services need to be provided by the government to increase your frequency of participating physical activity? After content analysis, the research discovered that on the issue of promoting physical activity for the whole people, “increase exercise facility and field” was the key to increase the frequency of participation. Answers similar to or related to “increase exercise facility and field” received 30.04% of 7,674 subjects. Also, 1,731 subjects believed that the key was in “promote the concepts of exercise and health” and 1,573 subjects mentioned, “open school sports facility and fields”. Moreover, 786 subjects and 613 subjects mentioned, “increase professional exercise consultant” and “more sports competitions”. 603 subjects believed “free courses on exercise instructions” as the keys to promoting frequency of exercise participation. Last, 63 other replies in this questions were categorized into “the others” with 0.82%: “not clear about government policy”, “no opinion”, “strengthen economy”, “no time to think about this matter”, “more promotion”, “no interests in understanding government policy”, “financial support”, “no need to development this kind of policy”, “never thought about it”, “depends on individual interest”, “plant more trees”, “plan more one-way street”, “employment for all”, “no need for exercise because it is not important”, “don’t understand the question”, “no interests at the present time”, “need a partner”, “not important”, “have not thought about it”, “increase welfare so people will have time”, and etc. What are some of the service need to be done for you to form a regular habit of doing physical activity? There were 2,351 subjects (30.64%) voiced opinions similar to “increase sports facilities and equipments”. Moreover, 1,753 subjects believed that the government needed to “promote the concept of health and physical activity” for the public to form a regular habit of doing physical activity. “Open school sports facility and fields” received 20.39% in this question. 745 subjects (9.71%) mentioned that “increase professional exercise consultants” was the key to help the public form regular exercise habit. In addition, 528 subjects believed the government needed to “hold more sports competitions”. Finally, replies such as “not clear about government policy”, “no time for such a question”, “strengthen economy”, “no opinion”, “improve community center”, “enhance promotion”, “training of sports talents”, “no interest in understanding government policy”, “no need to develop policy”, “no interest at present”, “not important”, “Exercise when one feels like it”, “need a partner”, “transform one’s life style”, “depends on the situation”, “initiate physical activity for all”, “depends on one’s desire” and etc are classified into “the others”, which covers 1.04%. What do you think it needs to be done the most to improve the standard of physical education and sports? To improve the standard of physical education and sports, 2,351 subjects (30.64%) mentioned “future plan for the elite athletes”. Also, 1,684 subjects believed the governments should “increase equipments of the sports field and facility” and 1,598 subjects would like to see “practical physical education from childhood”. Moreover, “develop specific sports” and “hold international competition as well as “invite outstanding coaches” received 9.59%, 8.50%, and 7.74% in this question. Last, 59 subjects provided replies such as “not clear about the government policy”, “no opinion’, “never thought about it”, “haven’t paid too much attention to it”, “more encouragement to the athletes”, “financial aid from the government”, “value athletes”, “increase the public’s interests”, “change government policy” and etc. The above replies are classified into “the others” which received 0.77% in this question. There were 4,014 subjects refused the interview in this research. The reasons provided were as the following: “no time” with 78.77%, “not in the mood to do the interview” with 6.43%, “don’t understand the meaning of the questions” with 5.78%, “questions are too long and complicated” with 4.91%, “not interested in this research” with 2.67% and “questions involved personal information with 1.44%. This study interviewed 11.688 subjects, and 4,014 out of 11,688 subjects refused to be interviewed whereas 7,674 subjects accepted it. The success rate is 65.66%. According to Babbie (1998), when adopting questionnaire interview as a tool for collecting data, the success rate has to reach 50% to be applicable. When the success rate reaches 60%, it is considered positive. When the success rate reached above 70%, it is considered very positive. The success rate in this research is between “positive” and “very positive”. Therefore, it is suitable for further data analysis. The result of the study indicated 90% of the subjects participated in the physical activity in the past three months. This result is similar to and even higher than the researched by Chen and Yang (1999), which Excutive Yuan, PE Committee authorized the investigation. In general, the top six most participated physical activities are: walking, jogging, basketball, hiking, excursion and mountain climbing. Many researchers in Taiwan (Chen and Yang, 1999; Excutive Yuan, 2000a; Executive Yuan, PE Committee, 2000) reached similar outcome. At the same time, Australian researchers Darcy and Veal (1996), American researchers Vries and Bruin (1996), Cordell, McDonald, Lewis, Miles, Martin and Bason (1996) all pointed out “walking” is the most common physical activity of the general public and other physical activities are focus on outdoor recreation. Moreover, the main reason for physical activity is “to create strength and heath”, which resembles the research result of Clough, Shepherd and Maughan (1989). The reason for the resemblance is probably related to the illness and pressure from the civilization. People are trying to seek mental and physical health and to improve strength through physical activity. Furthermore, the main reason for no physical activities in the past three months is “too busy in school, housework, children bearing so there isn’t any time”. 72.73% indicated the above reason for not having physical activity, which demonstrated time is an influential factor in affecting the participation of physical activity. There are about 70% of the subjects watched sports competition or related programs. The top five most watched competition and related programs are jogging, baseball, soccer, basketball and mountain climbing. The result of the research also pointed out Taiwanese public is deeply influenced by television, which is the most utilized when enjoying the sports competition and related programs. Jogging is the top watched program could be caused by that jogging is also the most participated activity. From January 2002 to September 2002, Taiwan hosted 22 various activities related to running including many international race and Iron Man Triathlon. Therefore, jogging is the most watched activity. In addition, the fever of 2002 World Cup in Korea and World Baseball Championship hosted in Taiwan resulted highly exposed baseball and soccer. All of the above reinforce the results of the research to a certain degree. Moreover, the top six most wanted to participate activity in the future are also related to the most participated activity. These activities are walking, jogging, basketball, mountain climbing, hiking, and excursion. This indicated that people are more interested in outdoor recreation activities. Also, this also revealed that people’s immobility in the physical activity and the unwillingness to change the engaged activity. There are only about 60% of subjects have regular habit of doing physical activity. Comparing to the study prepared by Chen and Yang (1999), it has grow substantially. 40% out of the 60% exercised once a week and 50% of the subjects reported one hour or less for each session. The intensity is “moderate” to “low”. Also, the time for physical activity or exercise focuses on “early morning” and “afternoon”, and subjects indicated not having partners. The locations are centered on “park” or “school facility and field” where only require “10 minutes or less” in traveling. The research also revealed that as much as 90% of the subjects pay no regular fee for doing physical activity. All of the resulted are related to the most participated physical activity. In the meanwhile, 60% subjects received most of the physical activity related information from television. In the analysis of values toward physical activity, subjects revealed the top five values are health, team cohesion, obeying rules, sports spirit, and recreation. This indicated the main concept in physical activity is established on the premise of “health”. Simultaneously, influenced by the engraving impressions of the sports, subjects also pointed out values such as, team cohesion, obeying rules, and sports spirits that are related to sports competitions. Subjects believed that to increase people’s interest, frequency and participation in physical activity, the government needed to “increase sports field and facility”. Moreover, government needed to provide “future plan for elite athletes” in order to increase standards of physical education. Since the results reveal the demand for sports field and facility and to improve the standards of physical education, providing a foreseeable future is the first step. Last, 4,014 subjects pronounced “no time” to reject the interview. The rejection rate is around 80%, which could be caused by the time for conducting phone interview from six to 9 in the evening. This period of time is usually for dinner or television. Therefore, in the future research, it is important to broaden the interview time frame. Bucher, C., & Krotee, M. (1998). Management of physical education & sport. Boston: Mosby Year Book. Bernstein, D. A., Clarke-Stewart, A., Roy, E. J., Srull, T. K., & Wickens, C. D. (1994). Psychology. Boston: Houghton Mifflin Company. Babbie, E. (1998). The Practice of Social Research. New York: Wadsworth Publishing Company. Chen, H. Y. & Yang, C. H. (1999 ). The Survey of Population Participating Leisure Activities in Taiwan Area. Taipei: National Sports Council, Executive Yuan, R. O. C.
Cordell, H. K., McDonald, B. L., Lewis, B., Miles, M., Martin, J., & Bason, J. (1996). United States of America. In G. Cushman, A. J. Veal & J. Zuzanek (Eds. ), World Leisure Participation: Free Time in the Global Village (pp. 17-34). Oxon, UK: CAB International. Clough, P., Shepherd, J., & Maughan, R. (1989). Motives for participation in recreation running. Journal of Leisure Research, 21(4), 297-309. Darcy, S., & Veal, A. J. (1996). Australia. In G. Cushman, A. J. Veal & J. Zuzanek (Eds. ), World Leisure Participation: Free Time in the Global Village (pp. 17-34). Oxon, UK: CAB International. Darley, J. M., Glucksberg, S., & Kinchla, R. A. (1990). Psychology. NJ: Prentice Hall. Dennett, D. C. (1991). Consciousness explained. New York: Little, Brown & Company. Directorate General of Budget Accounting and Statistics, Executive Yuan, R. O. C. (2000 a). 2000 Social Development Trend. Taipei: Directorate. Directorate General of Budget Accounting and Statistics, Executive Yuan, R. O. C. (2000 b). Report on the Survey of Family Income & Expenditure in Taiwan Area of the Republic of China. Taipei: Directorate General of Budget Accounting and Statistics, Executive Yuan, R. O. C.
Directorate General of Budget Accounting and Statistics, Executive Yuan, R. O. C. (2002 a). Economics and Social Index. Taipei: Directorate General of Budget Accounting and Statistics, Executive Yuan, R. O. C.
Directorate General of Budget Accounting and Statistics, Executive Yuan, R. O. C. (2002 b). Report on Human Resource in Taiwan Area of the Republic of China. Taipei: Directorate General of Budget Accounting and Statistics, Executive Yuan, R. O. C.
Hobson, J. A. (1994). The chemistry of conscious states: How the brain changes its mind. Boston: Little, Brown & Company. Jacoby, L. L., Lindsay, D. S., & Toth, J. P. (1992). Unconscious processes revealed: attention, awareness, and control. American Psychologist, 47(6), 802-809. Liu, H. J., & Wang, J. C., (1999). An investigation in Taiwanese residents motivation of participating physical activity. Taipei: Executive Yuan, PE committee. Liu, H. C. & Wang, C. C. (1999). The Survey of People Willing to Participate Sports in Taiwan Area. Taipei: National Sports Council, Executive Yuan, R. O. C.
National Sports Council, Executive Yuan, R. O. C. (2000). The Sports Statistics in R. O. C. Taipei: National Sports Council, Executive Yuan, R. O. C.
Third Bureau, Directorate General of Budget Accounting and Statistics, Executive Yuan, R. O. C. (2001). 2000 Social Indicators Contents. Taipei: Directorate General of Budget Accounting and Statistics, Executive Yuan, R. O. C.
Based on the experiences and knowledge of a sport marketing university professor and the CEO of a sport marketing firm, this paper provides a hands-on status report on sponsorship management. It provides a contemporary view of sponsorship theory and practice in an effort to provide readers with a view on sponsorship as it functions both in terms of its use by practitioners and its significance in management theory. Sponsorship, a relatively recent promotional tactic is where a “corporation [or other investor] creates a link with an outside issue or event, hoping to influence the audience by the connection” (Rifon, Choi, Trimble & Li, 2004). This ‘link’ or ‘association’ with a specific property (known as the ‘sponsee’) is the key in differentiating sponsorship from other promotional strategies, as it enables the investor (known as the ‘sponsor’) to not only receive the related promotional benefits (TV/print exposure, branding opportunity, etc.) but to be associated, in the minds of consumers, with the sponsee. For example, Lachowetz & Irwin (2003), in their survey of 500 spectators at the 2000 FedEx St. Jude Classic golf tournament, found evidence suggesting that spectator response to the sponsor (FedEx) is influenced by their affinity for the cause which the tournament benefits (St. Jude’s Children’s Research Hospital). In a similar fashion to the American Marketing Association’s recent update of its widely-accepted definition of marketing to focus on relationships, sponsorship is viewed in current management thinking as a relationship. Akin to other promotional strategies, sponsorship also enables a sponsor to efficiently reach its target market (e.g. Rodgers, 2003), making sponsorship important to sponsors, sponsees and affiliated entities such as a benefiting charity, a sponsorship sales agent, an event manager or a facility provider. Its importance stems from a few major factors. First, a major challenge in developing advertising strategies involves navigating the increasingly cluttered advertising space that exists today (Arthur, 1998). Faced with the challenge of this clutter, it is no longer enough for many organizations to promote themselves through advertising alone and sponsorship may provide an efficient way by which to differentiate a sponsor from its competitors (Fahy et al., 2004; Amis, Slack & Berrett, 1999). Second, evidence of the attractiveness of sponsorship relative to other promotional tools is demonstrated by sponsors who have supported their initial sponsorship investment with additional funds to leverage that investment. Leveraging, used in this context, refers to strategies that the sponsor funds and implements to increase the effectiveness of the sponsorship. These techniques are varied and include such things as the title sponsor of a televised event developing commercials and paying for their diffusion leading up to, during, and following the event. Reebok, for example, recently increased its annual budget to leverage its sponsorship investments to US$12.6 million (Kolah, 2003), which means that the organization spends over $12 million annually to leverage its sponsorship investments. The objective of this paper is to position and support sponsorship as a promotional activity from the planning stages through to its activation. It will be shown to be distinct from other promotional strategies (e.g. advertising, public relations, and sales promotions) and to be distinct from philanthropy including capital campaigns (major gifts). Philanthropy refers here to any fund-raising effort that seeks donations (i.e. a gift of a contribution where the donor requires nothing in return). Further, the need for both sponsors and sponsees to incorporate sponsorship-specific initiatives and resources into their promotional budgets will be demonstrated. In order to accomplish this mandate, the authors will draw on their own experiences, knowledge and research. It is the authors’ hope that this paper will demonstrate to the decision-makers in organizations (both sponsors and sponsees) that sponsorship is not a form of corporate donation but a two-way marketing relationship where cash or in-kind resources are exchanged for promotional value. For the sponsorship relationship to be successful, the sponsorship must be properly leveraged by the sponsor and serviced by the sponsee, with an accompanying leveraging program. By means of contrast, major gifts are not recognized as providing promotional value as evidenced in the reasons in the elements of attraction of gift giving (Martinis, 2005), inferring that they are not sponsorship. The white paper is organized in four sub-sections. First, a brief description of sponsorship and its nuances is described, with particular emphasis on current sponsorship practice. Second, a brief review of current management theory will be presented to support sponsorship’s position in management practice. Included in this section will be a short review of the sponsorship industry. Third, supporting evidence from the authors’ professional experiences will be provided. Finally, a summary paragraph will present the authors’ concluding policy statement. In contemporary business practice, corporations invest in sponsorship; they no longer have the excess marketing funds or open leeway to simply undertake goodwill gestures. This evolution and maturation of sponsorship into a key strategic element of the marketing mix has led to a high level of practitioner need for cost-effective, accurate and reliable sponsorship evaluation methodologies as the greatest challenge facing practitioners is clearly the demonstration of sponsorship effectiveness. In response to this need, researchers are working to fill that gap. As corporations (sponsors) and their agencies spend more time analyzing and assessing the business performance of their sponsorship investments and related leveraging activities, the properties (sponsees) they work with must be prepared to respond by effectively servicing the sponsorship. This response is being demanded in terms of increased media value, stronger integration of the sponsor’s brands with the property, and via more highly leveraged activation programs. It has become clear that, in order to insure the long-term success of the overall sponsorship, the sponsee must properly service the current needs of the sponsor by ensuring that its internal sponsorship management resources are appropriately structured. Such structure needs to include units within the organization that specialize in sponsorship sales, sponsorship activation and sponsor servicing. If the sponsee is to continue to generate the resources (cash and/or in-kind products/services) and brand association that comes with successful long-term sponsorship relationships, all three of these units must be in place. The demands placed on a property’s sponsorship sales department are driving them to become even more integrated with the other functions in the organization. This has become even more pronounced as sponsors move from simply buying an affiliation or media spots through a property and are now interested in creating brand activations. The concept of brand activation is defined as consumer connectivity, and therefore the sponsorship program needs to be integrated with the departments that most touch the consumer. Of specific note within these stats is sponsorship’s contribution to global promotional spending, which has increased in importance from 2.5% in 1987 to an estimated 5.8% in 2001 (IEG, 2000). This suggests that sponsorship has become an integral part of the promotional mix and is supported by a number of studies (e.g. Meenaghan, 1991). In practice, sponsorship has clearly become an important revenue source for sponsees and a valuable promotional strategy to sponsors in many industries. The literature now positions sponsorship to be completely different that other promotional strategies given three main points of difference: (i) that sponsors are believed by consumers to be ‘part of the program’ [due to the association effect], (ii) that sponsorship and advertising function differently [i.e. the process by which the promotion is communicated], and (iii) that sponsorship is believed by consumers to benefit a broader audience. National Capital Commission (NCC) – The NCC is a crown corporation of the Government of Canada founded to act as the steward of various lands and buildings owned by the Government of Canada in the National Capital Region (Ottawa, Ontario). A variety of sporting events are held on NCC property. Toronto Parks & Recreation (TPR) – TPR is the branch of the City of Toronto responsible for all the parks and recreation activities in Canada’s largest city. A variety of sporting events and activities take place on TPR property. Tennis Canada (Montreal & Toronto) – Tennis Canada is the National Sport Organization responsible for the sport of tennis in Canada. Halifax Dartmouth Canada Day Committee – This Committee is responsible for all Canada Day celebrations and activities, including several sporting events, that take place on Canada Day (July 1 st) in the Nova Scotia’s largest city. Canadian Football League (CFL) – The CFL is Canada’s NFL. It is a professional football league with 9 teams who play a full season each fall leading to the awarding of the Grey Cup. Telus Ski & Snowboard Festival (Whistler) – This Festival is an annual event that draws skiers and snowboarders to Whistler, BC for a variety of related events and activities. Each of these properties work with many of the largest and most powerful sponsoring corporations in the country and all are seeing substantial growth in their sponsorship portfolios. At the same time, these properties are coming under increased pressure to provide ROI for their sponsors. This strongly supports the mandate of this article. In our dealings with these organizations we are seeing three notable shifts in their approach to sponsorship management, where organizations involved in sponsorship are expressing the following. They are emphasizing the selling of sponsorship inventory on a more consultative packaging approach. A consultative packaging approach here refers to the fact that the sponsorship exchange is becoming more sophisticated and both sponsors and sponsees are providing and demanding more than just cash/product or promotional value in the relationship. They are interested in brand, associations and long-term effects. They are exhibiting significant advancements in their in-house sponsorship expertise and the professionalism and specific-skill-sets of the personnel in their sponsorship departments. They are providing more opportunities to both their agents and their sponsees to integrate the sponsor’s activation with event programming and marketing (i.e. additional leveraging activities). Both management theory and the authors’ professional experiences point to the need for sponsee’s to be properly structured in order to deal with corporate sponsors who view their investment as a marketing relationship not a donation. Being structured as such, will allow the sponsee to fulfil the needs of their sponsor and work towards developing successful long-term relationships with sponsors that will provide the resources they need, as well as improve their brand via the association. Amis, J., Slack, T. and Berrett, T. (1999). “Sport sponsorship as a distinctive competence”, European Journal of Marketing, 33(3/4), 250-272. Arthur, D., Scott, D., Woods, T., and Booker, R. (1998). “Sport Sponsorship Should… A Process Model for the Effective Implementation and Management of Sport Sponsorship Programs”, Sport Marketing Quarterly, 7(4), 49-60. Cunningham, W.H. and Taylor, S.F. (1995). “Event Marketing: State of the industry and research agenda”, Festival Management & Event Tourism, 2, 123-137. Fahy, J., Farrelly, F. and Quester, P. (2004). “Competitive advantage through sponsorship: A conceptual model and research propositions”, European Journal of Marketing, 38 (8), 1013-1030. Kolah, A. (2003). Maximizing the Value of Sponsorship. Sport Business Group Limited Publication. Kuzma, J. R. & Shanklin, W. L. (1994). Corporate sponsorship: An application for analysis. In Graham, P. J. (Ed. ), Sport business, operational and theoretical aspects. Madison, Wisconsin: Brown and Benchmark. Lachowetz, Tony and Richard Irwin (2002), “FedEx and the St. Jude Classic: An Application of a Cause-Related Marketing Program (CRMP)”, Sport Marketing Quarterly, 11(2), 114-118. Meenaghan, T. (1991). “Sponsorship – Legitimising the medium”, European journal of marketing, 25(11), 5 – 10. Rifon, N.J., Choi, S.M., Trimble, C.S., and Li, H. (2004). “Congruence Effects in Sponsorship”, Journal of Advertising, 33(1), 29-42. Rodgers, Shelly (2003), “The Effects of Sponsor Relevance on Consumer Reactions to Internet Sponsorships,” Journal of Advertising, 32 (4), 66-76. 6 The American Marketing Association’s new definition is “marketing is an organizational function and a set of processes for creating, communicating and delivering value to customers and for managing customer relationships in ways that benefit the organization and its stakeholders” (AMA, 2004). Only a sample of the authors’ knowledge base is presented. For further supporting case studies and empirical research, email mark.harrison@trojanone.com or noreilly@ryerson.ca. It is relatively common for football teams to find themselves down by two touchdowns late in the game. If they score a first touchdown then coaching folklore says that the team should go for the extra point at that time. In this paper I will show that this strategy, which appears to be universally used in both the NFL and the NCAA, is incorrect, and that going for the two-point conversion after the first touchdown is nearly always significantly better. I will also show that going for the extra point after the first touchdown is only correct if either the coaches believe that they have about a two thirds chance of winning in overtime (which seems rash after a tied game when the result of the coin toss is still obviously not known) or if they believe that their chances of making a two-point conversion are far below national averages. On September 10 th, 2005, the University of Michigan football team was trailing by 14 points when they scored a touchdown with 3:47 left in their game against Notre Dame. Their coach decided to kick an extra point to get within seven points. Even though this strategy is followed in the NCAA and the NFL almost without exception, it is, in general, incorrect. In this paper I will show that the correct strategy in this situation is to immediately attempt the two-point conversion. Go for two first: Under this strategy the team attempts a two-point conversion when they score the first touchdown. If it succeeds then they go for the extra point after the second touchdown in an attempt to win the game. If the first one fails, which happens on average about 57% of the time, then they attempt another two-point conversion after the second field goal in an attempt to go into overtime. Although this strategy is apparently never used in professional or college games, and isn’t intuitively very good, I will show that it is clearly the best approach to take, based on well known probabilities for extra point and two-point conversion success rates. Go for one both times: The commonly used strategy is to attempt the extra point after both of the touchdowns, playing to go into overtime. If the first extra point misses, which happens on average about 6% of the time, then the backup plan is to go for the two-point conversion after the second touchdown. Although this strategy is almost uniformly used, I will show that it is very inferior to the “go for two first” strategy. Go for one then two: Under this strategy the team attempts the extra point after the first touchdown and then a two-point conversion after the second. This strategy is sometimes used when the coaching staff believes that their team is unlikely to win in the overtime and so they should go for the win now. As an example of this (Mallory & Nehlan, 2004) discuss, without criticism, a game where Bowling Green used this strategy to beat Northwestern in 2001. However I will show that it can never be as good as the “go for two first” strategy, and so it should never be used. A fourth possible strategy, “go for two both times,” makes no sense logically or mathematically, unless the team’s extra point special team is so terrible that its chance for success is less than the chance for making a two-point conversion, and so I will ignore it here. In summary, I will show that the “go for two first” strategy is considerably better than the commonly used “go for one both times” strategy, and that the “go for one then two” strategy should never be used. The NCAA and the NFL have similar statistics for the success rate of two-point conversions and extra points. In the NFL the figures are 43% for the two-point conversion and 94% for the extra point, while in the NCAA the figures are 43.5% and 93.8% (Mallory & Nehlan, 2004). I’ll use the 43% and 94% figures for most examples in this paper, and will also develop the general formulas to show when the “go for two first” strategy is best. I’ll assume initially that the two sides have equal chances of winning the overtime, and will then extend the analysis to consider the more general case of what to do if, for example, the coaching staff believes that they have a higher or lower chance of winning in the overtime. I’ll assume a minimal level of probability knowledge for the rest of this paper. In particular I will assume that if there are two independent events like attempting a two-point conversion after one touchdown and then an extra point after another touchdown then the probability of both succeeding is the product of their probabilities. E.g., if the two-point conversion has a 43% chance of succeeding, and the extra point has 94%, then these will be assigned probabilities of 0.43 and 0.94, respectively, and the probability of both succeeding is 0.43 × 0.94, which is 0.4042, which using percentages is 40.42%. Initially I’ll just look at the average case where the percentages for the two-point conversion and the extra point are 43% and 94%, respectively, (and so the percentages for failing on the two-point conversion and missing the extra point are 57% and 6%, respectively), and where the teams are equally likely to win if the game goes into overtime. Then I’ll generalize the mathematics to other percentages. Under the “go for two first” strategy the team will score three additional points (i.e. in addition to the twelve points for the two touchdowns) if they get the two-point conversion and the subsequent extra point, two additional points when either they miss the first two-point attempt and hit the second or when they make the two-point attempt but miss the extra point, or no additional points if they miss both two point attempts. One additional point cannot occur under this strategy. The probability of three additional points, which will win the game, is 0.43 × 0.94 (making the two-point and then the conversion), which is 0.4042. The probability of two additional points (making the two-point and missing the extra point or missing the first two-point but getting the second) is 0.43 × 0.06 + 0.57 × 0.43, which is 0.0258 + 0.2451, which is 0.2709, which will send the game into overtime. The probability of zero additional points, which will lead to a loss, comes from missing both two-point attempts, which is 0.57 X 0.57, which is 0.3249. So there is a 0.4042 chance of winning outright plus a 50% chance of winning the overtime, which adds half of .2709, for a total winning percentage of 0.540. The “go for one both times” strategy requires hitting both extra points, which has a probability of 0.94 × 0.94, which is 0.8836, or missing the first one and then attempting the two-point conversion which has a probability of 0.06 × 0.43 for an additional 0.0258, and then assuming a 50% chance of winning the overtime gives this strategy a winning probability of half of 0.9094, for a winning percentage of 0.455. The “go for one then two” strategy is the worst. It succeeds and wins the game when both succeed with probability 0.43 × 0.94, which is 0.4042, and ties and goes into overtime if the extra point is missed but the two-point conversion succeeds, which will add half of 0.06 × 0.43, for another 0.0129 and for a total winning probability of 0.417. Clearly the proposed strategy, even though it is not commonly used, is by far the best strategy to take in this average case. ((1-x)xz). The “go for one both times” strategy wins if either both extra points succeed and you win the overtime (yyz) or the first one misses but the backup two-point conversion succeeds, and again you win in overtime ((1-y)xz). Finally the “go for one then two” strategy wins if the extra point and the subsequent two-point conversion both succeed (yx) or the extra point fails and the subsequent two-point conversion succeeds and you win in overtime ((1-y)xz). At this point we can completely reject any further consideration of the “go for one then two” strategy because the “go for two first” strategy always has (1-x)xz better probability and this quantity can’t be negative. (In most practical cases it will be about a 0.12 higher probability, or a 12% higher percentage.) The problem with the “go for one then two” strategy is that if the two-point conversion fails then the game is lost, while with the “go for two first” strategy if the two-point conversion fails then the team can attempt a second two-point conversion, going for the tie, after the second touchdown. Given a particular value for y, your probability that you’ll make an extra point, we can compare these two formulas to determine how confident you need to be in your two-point conversion before you decide to use the “go for two first” strategy. As we’ll see, if you believe that you will make at least 38.2% of your two-point conversions (which is significantly below the national average) then you should always use the “go for two first” strategy, even if you know that you’ll never miss an extra point. As you reduce your confidence in your extra point special team, your required confidence in your two-point conversion team can drop even further and still mandate the use of the “go for two first” strategy. So, for example, if you have a poor kicking team and only expect to make 90% of your extra point kicks then you should use the “go for two first” strategy if you expect to make at least 32.8% of your two-point conversions. So, for example, if your kicking team only succeeds 90% of the time with extra points, then if you estimate that you will make a two-point conversion at least one third of the time then you should adopt the “go for two first” strategy. A normal kicking team in either the NCAA or NFL should use the “go for two now” strategy if they can expect to make at least 35% of their two-point conversion attempts. I’ll rebuild the table that I had above for two situations; when the coaching staff aren’t very confident going into overtime, and estimate their chances at 45%, and when they are confident and estimate their chances at 55%. These figures show that even if you are fairly confident that you will win in overtime (55% confident) then you should still use the “go for two first” strategy unless you think that your chances of making a two-point conversion are way below the 43% average, and that if you believe that your chances are not good in an overtime (45%) then you should use the “go for two first” strategy unless your two-point conversion team is really awful. , which is 0.633 or 63.3%. So the traditional “go for one both times” strategy should only be used if you believe that your team is nearly twice as likely to win as the opponents in overtime, which seems a wildly optimistic assumption after tying in regular time. I have shown that under nearly all circumstances the “go for two first” strategy is significantly better than the “go for one both times” strategy when trailing by two touchdowns late in the game, and than also the “go for one then two” strategy should never be used. The only times when the “go for one both times” strategy should be used is when either the coaches believe that they are nearly twice as likely to win as the opponents are (which seems overly optimistic after a tied game unless there are external factors like late injuries to some of the opponent’s important players) or when they believe that their team is far below average at making two-point conversions. Since the correct strategy never appears to be used, an interesting question is why coaches have always got it so wrong. They have probably been led astray by the expected value of going for two point conversions vs. extra points. The expected value is the expected long term return from taking a particular action. In the case of a two-point conversion it is, for a typical team, (2 points)x0.43, which is 0.86 points each time that you try it. For an extra point it is (1 point)x0.94, which is 0.94 points. So for most of the game kicking extra points after touchdowns is slightly better than going for two-point conversions. When trailing at the end of the game the expected value of the points is no longer relevant, since all that matters is whether you are more or less likely to win. Looking at it differently, if the coaches use the “go for two first” strategy then, as we saw earlier, there is a 0.4042 of winning outright, a 0.3249 of losing outright, and the rest of the time (0.2709) you’ll go into overtime. So you are more likely to win than lose. Using the “go for one both times” strategy there is no chance of an outright win, a 0.9094 of going into overtime, and the rest of the time (0.0906) you will lose outright. So with this strategy you are more likely to lose than win. One reason expected values don’t help here is that if you lose outright with the “go for two first” strategy it will be by two points, but with the “go for one both times” strategy it will sometimes be by only one point, but a loss is a loss, so this isn’t relevant. In this paper I haven’t discussed how to handle other situations like trailing by seven points (attempt the extra point) or by 21 points (go for two first). I also haven’t discussed high school football because two-point conversion attempt and extra point percentages vary so spectacularly across high school teams. However once high school coaches have some estimates for their team’s percentages in these two areas they can use the formulas in this paper to determine their best approach. It appears that for all practical cases the “go for two first” strategy will also be best for them. Mallory, W. & Nehlan, D. (eds.) (2004). Complete Guide to Special Teams, American Football Coaches Association, ISBN 0736052917. Smith, M. (n.d.) Splitting the Overtime Pizza, Football Outsiders Web Page, Retrieved September 19, 2005, from http://www.footballoutsiders.com/ramblings_print.php?p=87&cat=1.